Click the button below to add the Refurbished Optoma HD28Dse 3D 1080p Home Theatre Projector with Darbee Visual Presence to your wish list. 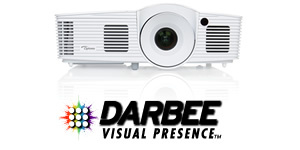 The HD28DSE is a powerful home cinema projector engineered in collaboration with DARBEEVision™. DARBEEVision’s Visual Presence technology was created by Paul DARBEE in the 1970’s and was pioneered using an unorthodox technique that involved “defocusing” one of two images, using a video synthesizer to invert the image, and then combining the defocused inverted image with the sharp image. The end result produced images with unrivaled separation in depth, amazing detail and image clarity that is simply striking. The DARBEE Visual Presence™ enabled Optoma HD28DSE delivers an immersive experience in Xbox One and PS4 games, Blu-ray movies, HDTV programming, home videos and even vacation photos. 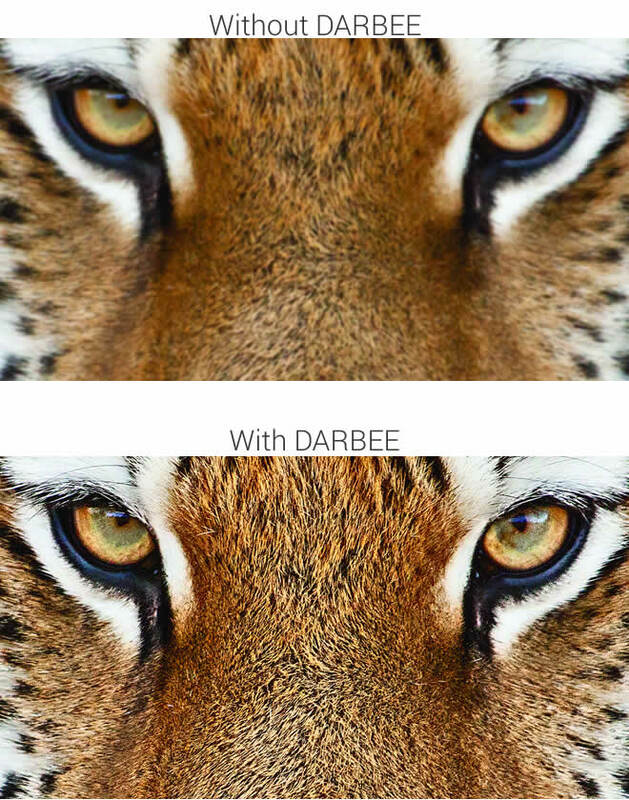 The integrated DARBEEVision™ image enhancement technology utilizes neuro-biologic algorithms to achieve unprecedented detail in skin tones, textures, and reflective surfaces while delivering superior depth, object separation and automatic removal of unsightly artifacts. The end result is Xbox One and PS4 games, Blu-ray movies, HDTV programming, home videos, and photos that are simply mind-blowing and larger-than-life. Installing projectors on a table or pedestal can quickly become a frustrating experience as tilting the projector from various angles to reach the projection surface can result in trapezoidal images and the need to use keystone correction, which is also a frustrating experience. With Four Corner Adjustment the trapezoidal image can be quickly corrected by adjusting the corners of the image in or out, which simplifies installation and eliminates frustration. The HD28DSE's features the latest and greatest digital media interface with support for MHL v1.2. 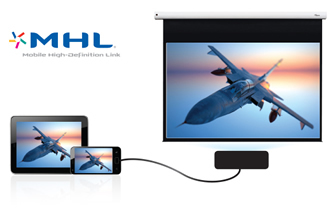 MHL v1.2 enabled HDMI ports allow MHL devices such Optoma's HD Cast Pro, Roku's Streaming Stick and Smart Phones to connect directly to the projector to playback music and video, view pictures and even share webpages and other user generated digital media content. Some external audio/video devices today require USB power or external AC power to function properly. To satisfy this requirement, the HD28DSE includes a powered USB port that is great for powering devices such as Chromecast and FireTV media dongles, Optoma's WHD200 Wireless HDMI System or any media device that requires USB power or AC power. Many projectors require a new lamp every 4000-5000 hrs, but with an excellent cost to performance ratio, the HD28DSE will only require one lamp every 8000 hrs when the lamp mode is set to Bright+Dynamic. 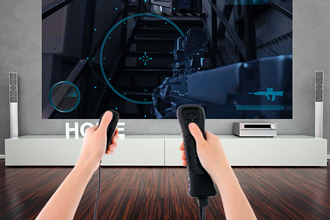 3D Compatibility Supports all HDMI 1.4a mandatory 3D formats (Frame pack, side-by-side, top-bottom) and up converts frame rate from 60 Hz to 120 Hz or 24 Hz to 144 Hz (i.e 60 or 72 frames per eye). 3D glasses are needed and are sold separately. Refer to user manual for details. I was very skeptical on this projector. It is so new that there are very few reviews out there for it. But that all when away the moment that we plugged it in. The projector did not need any additional adjustments to produce such a clear vivid and beautiul picture. It is so easy to use that the basic manual is only one page. I would reccomend this product for anyone that is wanting to have a projector for inside or outside use. We are even thinking about using this as our main source of television in the living room instead of just casual outdoor viewing. Spend the little extra $$ to get the very best on the market right now. Never have I been this impressed with a projector out of the box. I've spent my last 3 generations of projectors with Optoma, for their high quality, low cost solutions. The last being the HD25LV, which I considered the cream of the crop due to its bright, colorful picture and low cost lamps. I bought the HD28DSE after my HD25LV took a dive after 3 years of heavy use. Knowing I would be losing a little brightness, but gaining clarity via the Darbee video processing. We use our projectors as our primary TVs, so they get a ton of use and have to be bright enough to use in any lighting condition. As with every Optoma projector Ive used before it, this one required about 50 hours of break in time. I am not sure if it is the carbon burning off the bulbs or color wheel getting broken in, but out of the box it seemed dim and not representative of a 3000 lumen projector. The colors also didnt seem as saturated as they shouldve been. Again, this isnt a problem with the projector or brand, just a break in period that seems common with all Optoma bulbs and projectors and goes away after that burn in time. Once the break in period had come and gone, my jaw dropped. Not only was the brightness on par with that of the HD25LV... the color saturation was better and popped off of the screen. The Darbee processing has to be seen to be believed. It is the difference between LED and OLED(if youve ever seen an OLED set in action), making details and textures just pop off of my 120" screen in striking, almost 4K clarity. Giving the projected image the sharpness of any high end flat screen. Movies and DirecTV shows, whether 1080p or 480i, all benefitted from the processing. Making standard resolution material look as good as 720p and 1080p images look almost 4K quality. With details I never even saw on my 1080p flat screen. Lighting really benefits from the extended contrast @ 30,000:1, where dark scenes actually felt like they were filmed in dark locations. The lighting 1:1 with what was happening on screen. Lighter scenes popping. Details easily seen in both without oversaturation in light scenes or lost detail in dark. Gaming via my PS4 took on a new life. Looking so good, you would swear you were playing GTA V on a $2000 gaming PC in 4K. Texture depth accented with extreme detail and reflections that make the cars underneath look real. When it started raining, in the game, I could see individual raindrops that had translucency and distorted the lighting seen through them. In comparison, on my HD25LV... raindrops looked black and were all sort of lost in the background. Textures flat and colors bland. The HD28DSEs picture looks so good, that Im going back through my game library and replaying games just to see how good they look on this projector. First off this projector is amazing in ambient light. This is my 3rd projector, first two being a lcd (Sony and Panasonic) and the HD28 blows them out the water when compared to brightness. And that's even with eco lamp settings right out of the box. I bought this because my projector is now in my living roomy at our new house with big windows and lots of sunlight. My wife likes a lot of light so blinds or any treatment wasn't not an option. I thought a switch to a DLP would help but never expected it to help this much. In my pictures I literally have all the lights on in the room. And it's by far the brightest room in the house. The projector looks like a massive LED TV on the wall. And this is with a cheap white 92" screen. For brightness with ambient light and in a dark room I'd give it a 10/10. The overall picture quality is good. Still getting use to the Darbee settings. I've found the Hi-Def setting at 30-45% seems to work best. Any higher and the picture starts to look over processed. The colors are amazing. The brightness from being a DLP really seems to help with how vibrant they are. Slightly grainy at times with fast images but nothing out of the ordinary for a projector at this price. Something I feel could be tweaked within the settings as well. Picture quality 8/10. Awesome!!! This is my 1st projector. I did quite a bit of research before buying. The Darbee video enhancement was the clincher. This is the only projector using this technology. I was familiar with it because the newest OPPO Blu-ray player has it, and I know the OPPO's are among the best players out there. The contrast ratio, lumens, full HD, plus the Darbee enhancement put this way ahead of all the other players in terms of value. I was able to purchase this projector, a motorized 120" screen, a set of 4 active 3D glasses, and a few 3D Blu-ray movies for under $1000! A 70" 3D LCD TV would cost at least $1700- 2000. It seemed like a no-brainer. Okay, I finally set everything up and watched a few 3D movies, and I'm blown away. The picture and 3D exceed my expectations. Set up was super-easy. I currently have the projector on a table about 12 feet from my 120" screen, and I'd guess I'm getting about a 110" picture. I'm planing on hanging the projector from the ceiling as soon as the mount arrives. Also considering an RF emmitter and RF glasses. I've read that they provide the best picture quality. I'd welcome any thoughts regarding that from anyone that has used both DLP link and RF glasses. I just purchased this projector after owning an Infocus for 12 years with 720 display. OMG! this projector really fills my 108 inch screen with clear and bright picture. I did a lot of research because it has been 12 years since my last projector purchase and I want this to last me another 12 years or more. I hook my Samsung Blu-ray player up one HDMI to my Bose system and the other HDMI to my projector. Highly recommend this product to anyone that wants to get the theater affect with a economical cost of a high end projector. Had an excellent experience with Consigning buying this projector. The salesman was helpful and not pushy at all, and in fact upgraded me to this model for the same price as the less expensive HD142X. In practical use, the image quality is stunning. I have it projecting 80 inches at about 9 ft onto a white painted wall. With a few tweaks to the video settings, the image matches almost exactly what is shown on my 27" monitor. The trueness of the colours is shockingly good. The clarity is stellar, and the fans in the projector are quiet and cannot be heard when playing a movie. I can't say anything for the speakers as I'm using a pair plugged into my PC, but most projector speakers are pretty meh, so don't expect much. Setup was simple, I had the whole thing running how I wanted in under 20 minutes. I am yet to test 3D set up but brightness and focus is incredible. Although even BluRay is a bit grainy at 135" even with Darbie Vision set high, The shear size is just awesome to experience real life size cars etc . James Bond flick "Casino Royal" was terrific. Yet to experience more performance. Just been very busy at work and home. After using 3 different projectors in the last couple of years before this one, this HD28Dse is really impressive for this kind of price. After making test for the last 2 weeks I think I can give a decent review. Just plug in a good source, like a pc through hdmi, and start a game like Witcher 3 or Metal Gear solid V, and set the games in 3840 X 2160 Dynamic Super Resolution (go read about it) in the nvidia GeForce experience, and you won't even believe what you see in front of you. Even in eco mode it is Really brilliant and crisp. The sad part is, to use the 3d capabilty of this projector you need to buy the 3D RF Emitter Transmitter and their glasses (yes I know they are cheaper one alternative, but THEY give cheap 3d effect too), it is just stupid that I can't use my nvidia 3d vision kit with this projector. Even then I don't even know if I will be able to play my PC games in 3D with the Optoma 3D kit, or just a console will work. And it seems nobody anywhere knows the answer. Another con: boy the fans are noisy, its a chance my home theater can blow my walls off because with small speakers at low volume you will hear them. My friends and I have been buying from Consignia in the last couple of years and they have a really good service and they are reliable. I really recommend this projector to anyone who likes to love watching movies and playing game. It is just totally stunning with a good source. And Darby is not a gimmick at all, just dont set it too high for Nothing.